Ring Records released two Dutch language LPs in 1980. 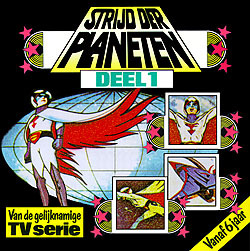 Each LP contained two full Battle of the Planets episodes with extra narration added to describe some of the action. Both records were also released on audio cassette. The first Battle of the Planets LP (left) included the episodes "The Space Monster 1" and "The Space Mummy 3." 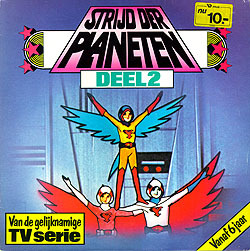 The second LP had the episodes "The Space Pirate 7" and "The Space Robot 6"